The former Lexington Hotel located on the northwest corner of West Portland Street and North Central Avenue is being transformed into the FOUND:RE Hotel Phoenix, a lifestyle hotel experience which includes custom designs and luxurious amenities inspired by contemporary art and fashion. Habitat Metro is bringing FOUND:RE Hotel to life who are also developing the Portland Place condominiums and Portland on the Park condominiums which are expected to open in the fall of 2016. Read the full article, “The FOUND:RE Hotel Designed to Cultivate Art Downtown“. Overall, crime within roughly a half-mile radius of the site has dropped 91 percent in three years, from 726 crimes in 2007, to 63 crimes in 2010, according to the Phoenix Police Department. Excitement grows as Oasis on Grand begins to become a reality. We tend to be pretty modest about what we do in our little corner of the Universe. At Habitat Metro World Headquarters, we have a simple rule when it comes to publicity. We don’t talk. We act. And afterwards, we try our best not to blow sparkles. Just the facts, ma’am, a la Jack Webb. But we think this is pretty cool. Our friend, Marshall Shore, the Impresario behind the Phoenix Metro Retro series of talks, dug this old photo up from the archives. And truth be told, we’ve been slow to let folks know what we have been working on along Grand Avenue. You see, we remain convinced that in this present time of economic distress and soul-searching, people are reevaluating how they organize their lives and are coming to the conclusion that quality of life matters. Just check in at any number of coffee shops in downtown or midtown Phoenix, whether it’s Giant Coffee, Fair Trade, or either of the Lola’s – people seem to be flocking to central Phoenix despite any other generalized anxieties they may have. They are searching for a textured life that is experience rich and unique. We think we may have something for them up our sleeves. For those of you unfamiliar with Grand Avenue, it was one of the Mother Roads in Phoenix. 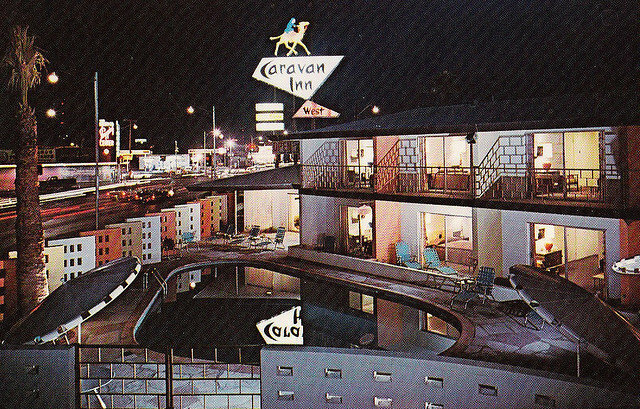 Designated as the US 60, it was a way station for travelers after a long drive, and home to a bevy of first and second generation motels, including the Caravan Inn/Oasis Hotel, located at 1501 Grand Avenue. 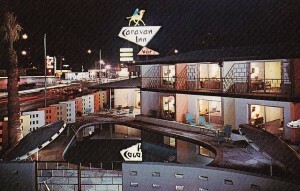 In its heyday, the Caravan Inn’s blend of kitsch and modern architecture provided a nice respite for its guests, but as auto traffic shifted to the I-10, the Caravan and its sister hotels along Grand Avenue and Van Buren Streets, were consigned to the dustbin of history as particularly inhospitable specimens of single-room occupancy motels. Our involvement at this site came at the invitation of the Carmody Companies, the site’s present owner. Tasked with re-imagining the building in its present incarnation, we collaboratively arrived at an exciting solution: we were going to reuse the building to offer affordable housing, with a particular focus on serving the needs of working artists that are already a part of the downtown arts community or who want to become a part of the downtown fabric. We are happy to announce that we will be initiating (fingers crossed) the adaptive reuse of the Oasis on Grand Apartments within the next few months. Comprised of sixty studios, one bedroom, and ground-level live-work residences along the building’s Roosevelt Street facade, we believe that the project will be a critical anchor to Lower Grand Avenue’s northern gateway at the intersection of 15th Avenue, Roosevelt Street, and Grand Avenue. Plus, it will build upon the pioneering efforts of the Grand Avenue Merchants Association to support arts-based adaptive reuse within central Phoenix. And, we are also pleased to announce that we will be opening up the Oasis, in is present, pre-construction condition, as part of the Re-Dapt Tours during the upcoming Grand Avenue Festival this Saturday, September 25th. For tickets and information click here. So come out and join us! We don’t bite. Really. In her seminal work The Death and Life of Great American Cities, Jane Jacobs observed that “Cities have the capability of providing something for everybody, only because, and only when, they are created by everybody.” Her observation came to mind after reviewing the Urban Land Institute’s Rose Center Advisory Services Program Report: Phoenix, Arizona. A bit of background: the Rose Center for Public Leadership in Land Use is charged to “encourage and support excellence in land use decision making.” Its Rose Center Fellowship Program tapped Phoenix Mayor Phil Gordon, along with three fellow mayors from throughout the United States, to lead working groups of professionals and key stakeholders within their cities in the examination of current land use and policy decisions facing their municipalities and develop a palette of proposed solutions. The recently published report on Phoenix outlined a number of major policy issues faced by the City of Phoenix and within the wider metropolitan area comprising the Valley of the Sun. Of the four recommendations that comprise its action plan perhaps the most ambiguous, if not sentimental, is the first: “Create a shared vision.” While policy actors, public and private stakeholders may aspire to such an achievement, it stands in stark contrast with the cacophony of voices present at any particular discussion of public or common import, especially when it such discussion involves the challenge of city building. Truth be told, we enjoy (for the most part) the manic energy that one associates with city making, and the attendant conversations and passions associated with such common endeavors. Those conversations and passions are constitutive components of a city. In fact, one could make the argument that those conversations and passions are elemental to the development of a civic soul and sense of place. Inscribed in arguments over what buildings to save, the width of a given sidewalk, or the material palette of a landscape plan are the cumulative opinions of countless residents, developers, city staff, and elected officials. Stories of how a particular decision was arrived at come to define and crystallize public and private values espoused in a given community at any point in its evolution. So we find ourselves in our stark little patch of desert at one of those interesting times, when we must grapple with larger questions about how we evolve as a city and community, physically, economically, politically, and possibly spiritually. Frustrated with the status quo? Involve yourself. Broken business model? Evolve yourself. The only way you can lose is by not engaging yourself in the conversation.